please call us and we will do our very best to help. Why use BLAKES of Belgravia? and continues to this day to offer the same high levels of service that it has traditionally offered. Our friendly expert staff are always happy to answer your questions and advise on the best solution and products for your needs. 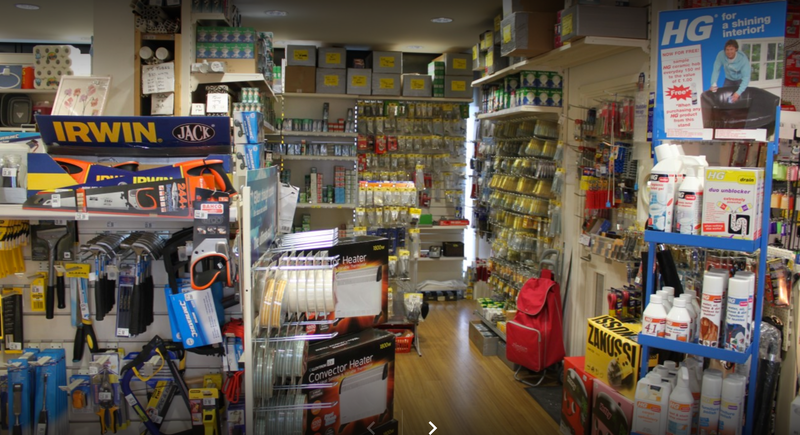 We stock an enormous range of products from Cleaning Materials to Henry Vacuum Cleaners, Hand Tools, Power tools, Ironmongery, Plumbing Goods, Comprehensive range of LED Lightbulbs, Torches and Batteries including Mag-Lites, LED Lenser torches, Victorinox Penknives. Small electrical appliances, kettles, irons, Dyson fans and heaters and Roberts Radios including the latest digital radios. Our stock of Ironmongery items is very large. We have Nuts, Bolts, Screws, Nails, Door Locks, Padlocks, Chains, Hinges and a full range of decorating equipment including Paint and Varnish, White Spirit, Brushes, Rollers, Sugar Soap and Steps, in fact, everything you need to paint a room or a whole house. We also have Tile Adhesive, Door Bolts, Smoke Alarms, Carbon Monoxide Alarms and a full range of Plumbing items including Compression Fittings, Plastic Waste Pipe, Capillary Fittings, PTFE Tape, Washing Machine Hoses and Fittings, Drain Rods and Wires and Drain Cleaners. We also offer a key cutting service and have a large range of key blanks in stock. This website can only touch on the full range of ironmongery that we stock, so please call in or phone us and we will do our very best to help you. We stock everything that is required to keep the house clean. We have Dusters and Polish, Dustpans and Brushes, Antiquewax, Goddards range of Cleaning Products, Mops, Buckets and Bowls, Drain Cleaners and Drain Rods, Cif, Dustbins, Mouse Traps, Rat Traps, Vacuum Cleaner Bags, Henry and Hetty Vacuum Cleaners details of which can be seen under our Electrical Section. We also stock a large range of products for the garden such as Slug Killer, Fly Killer, Hoses, Garden Sprays, and much much more. At Blakes we stock a wide range of hand tools and power tools. Tools for every kind of job for the professional and the inexperienced amateur. If you want advice on the best tool for the job, speak to one of our experienced staff who will do their very best to help you make the right choice. Among the many hand tools we stock are: Saws of all types, Hammers of all types, Wood Chisels, Cold Chisels, Planes, Tape Measures, Spirit Levels, Trowels, Forks, Spades Shovels, Spanners and many many more, and if we have sold out when you call we can get it for you the next day from our warehouse. We stock all the normal mains and rechargeable power tools, but if there is something you want which we do not have we can arrange a next day delivery. Among some of the power tools we stock are: Drills, Sanders, Circular Saws, Jig Saws and Planers. We stock all the accessories for power tools, Sand Paper, Drill Sets, Masonry Drills, Tool Boxes, Tool Bags and much much more. This site can only give you a flavor of all that we stock, so please call us now and our friendly expert staff will do their best to help. We stock Henry and Hetty Vacuum Cleaners, we have Kettles, Irons, Hairdryers, Fans plus Roberts Radios including the latest digital radios, plus the full range of Energizer, Led Lenser and Mag-Lite torches and every type of battery from hearing aid to lantern, and every size in between. Cable, Sockets, Switches, Extension Leads, Coaxial Cable, TV Ariels, Telephone Extension Leads, Modem Leads, Travel Adaptors and Insulation Tape. Like all of the other areas in the shop we have a large range of electrical products so please call in the shop or telephone and we will do our very best to help. Stocking Lightbulbs of every type including Low Energy Lightbulbs, Candles, Low Voltage Dichroic and Spots to name a few, Fluorescent Tubes and Light Fittings. We stock a vast range of light bulbs in almost every imaginable shape and size. For more information on any of our Products or general advice please visit our showroom. We have many ‘Bits n Bobs’ in our store. If you are passing by, pop in and if you can’t see it, just ask us. If we haven’t got it, the chances are, we can get it for you! We are here to help. Get in touch by phoning us or pop into our shop to let us know what you need. Blakes of Belgravia are here to help you. For your convenience, we accept all major cards and cash payments via our store. or pop in to our local friendly shop to speak with us directly.